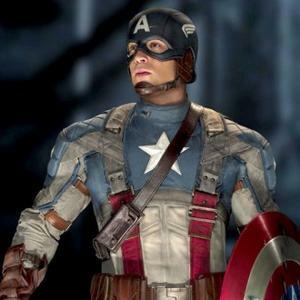 Thanks to a recent New York Times story, the Web is buzzing about the fact that the upcoming Marvel Studios movie Captain America: The First Avenger will be called simply The First Avenger in three countries: Russia, Ukraine, and South Korea. The news isn’t really new — EW, among others reported the title change back in January — but it does present an opportunity to consider how the film may perform overseas. After all, Captain America first appeared 70 years ago as an intentionally political anti-Nazi warrior who wore his patriotism on his sleeve… well, he wears it all over. Will foreign moviegoers jump at the chance to watch such an old-fashioned slice of Americana? The answer looks like it might be “yes.” For one thing, while three countries opted to discard Captain America’s name, everyone else decided to keep the original U.S. title. “That bodes well for the property,” says a source close to the film. “It shows the strength of the Captain America brand.” Paramount, which is releasing the movie domestically, allowed its international distributors to choose how to market the film on a country-by-country basis. And the fact that all but three countries opted for Captain America to stay in the title seems to indicate that these distributors weren’t overly concerned about possible anti-American sentiments in foreign markets. However, it must be pointed out that international audiences generally don’t embrace the superhero genre to the extent that American audiences do. While fantasy franchises like Pirates of the Caribbean andHarry Potter routinely collect at least two-thirds of their worldwide revenue from foreign markets, superhero movies like The Dark Knight, Spider-Man, and Iron Man seem to top out around 50 percent. If Captain America‘s overseas proportion finishes significantly below 50 percent, then one could say that the film’s foreign distributors potentially misjudged moviegoers’ willingness to embrace Mr. Red, White, and Blue. But, at this point, that doesn’t seem a likely scenario. Instead, Paramount should be losing the majority of its sleep over the film’s domestic release on July 22 — just one week afterHarry Potter and the Deathly Hallows: Part 2. Captain America may have fought against the Nazis, but he’s never had to contend with a teenage wizard before. Posted on July 7, 2011, in Comics, Movies and tagged Captain America, Chris Evens, Marvel, The First Avenger. Bookmark the permalink. 1 Comment.